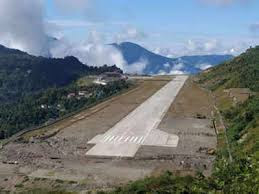 Prime Minister Narendra Modi has dedicated Sikkim’s first airport at Pakyong to the nation and said previous governments worked in a slow pace for ushering in development. Modi said his government is committed to make the Northeast an “engine of India’s growth story”. With the inauguration of the greenfield airport, the country currently has 100 airports, he said. “Since Independence the country had only 65 airports till 2014. But in the last four years, we have built 35 airports. Earlier the average was one airport every year, now the average is nine airports per year,” Modi said. He said in the last 70 years, the country had 400 aircraft but in one year 1,000 new aircraft were ordered by various airlines. “Our efforts were to enable common people who wear hawai chappal to travel by hawai jahaj (aeroplane),” he said.